Let's see ... there's out of this world scenery, dozens of quaint towns and villages, each one prettier than the last, sales tax free shopping, fine dining and attractions that appeal to every member of the family. How can you beat that? 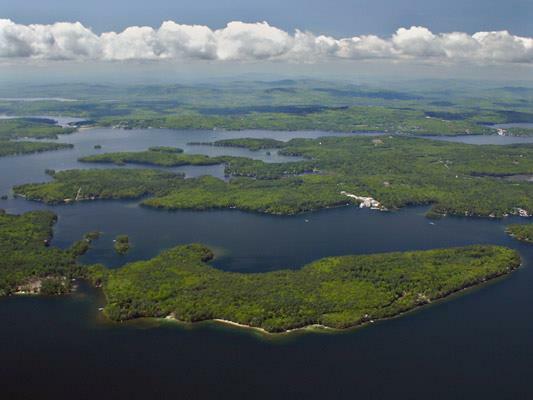 With 183 miles of shoreline and 274 habitable islands, Lake Winnipesaukee is the centerpiece of the Lakes Region. Recreational activities abound, and include boating, swimming, and scenic cruises in the summer, and skiing, ice skating, ice fishing, and snowmobiling in the winter add up to a perfect place to live! The big lake is surrounded by Ossipee, Belknap and Sandwich mountain ranges, all of which contributes to the spectacular scenery. Winnipesaukee is certainly the biggest, but by no means the only body of water in the area. In fact, NH boasts nearly 300 lakes and ponds for you to explore and enjoy. Lake Winnipesaukee means "beautiful water in a high place" and "The smile of the great spirit" from Indian folklore. Lake Winnipesaukee has 6 mapped ship wrecks. Water clarity is an amazing 23 feet! Distance around the lake: 183 miles. Height above sea Level: 504 feet. The Lake: This "Beautiful Water of the High Places" has always been held in very high esteem since primitive man first came to this scenic shore. Known as Winnipisseoke, or Winnipiseogee pond, and dozens of others very similar, the present Winnipesaukee name was made official by the New Hampshire Legislature of 1933. Area of 71.8 square miles(45,952 acres). Dimensions at 9 1/2 miles wide by 21 miles long. A flotilla of islands estimated at 365. The largest of these islands are Long Island (1,186 acres), Bear Island (780 acres), Cow Island (522 acres) and Governor's Island (504 acres). Lake Winnipesaukee ranks very high among the world's inland waters. It is the largest of nearly 1311 ponds and lakes in 9,302 square miles New Hampshire. The depth of 180 feet of water lies beneath your boat South East of Rattlesnake Island, with most of the lake resting between 20 and 100 feet deep. The elevation is changed by the annual spring runoff by an occasional drought (in 1941 the lake contained approximately 14,600,000,000 less cubic feet of water than normal, and in 1826 it may have been even lower). Before man dammed the falls at Lakeport over 150 years ago, the level was more than three to five feet below the present. Prior to 1832 the Weirs channel was 'a shallow way , and a short "river", before the advent of down stream damming, of about a three foot drop over a possible width of 150 feet, until the 1803 bridge was built. Lake Winnipesaukee was marked in 1899 with the first inland waterway bouys in the United States, over 300 hazards being indicated, with the present number of markers, light-buoys, and other navigation aids about 600. Navigation charts ate available at all marine stores and the like and Winnipesaukee topographic maps can be purchased at rock climbing and stationary stores. Public docking facilities are maintained at many points. 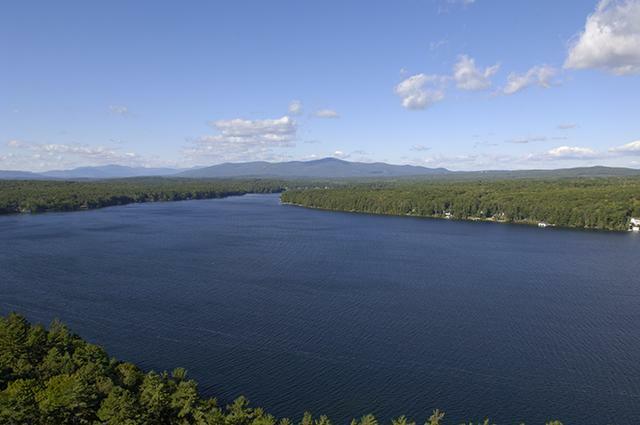 Lake Winnipesaukee is unusually pure for an inhabited body of water, and every effort should be takes by each property owner, boat operator, municipality, industry, and visitor to keep it so. With the mushrooming of population industry, and recreation, every citizen must be alert to preserve our lake as the beautiful heritage it is. Lake Winnipesaukee is well known for its annual Ice-Out Contest, in which people try to guess the date that the Mount Washington, a large cruise ship that carries tourists around the lake, can safely leave her port at Center Harbor and motor to four other ports. Since records began being kept in 1851 ice-out has happened as early as March 29 and as late as May 12, although 90 percent of the time it is declared during April. Lake Winnipesaukee is the sixth largest natural lake completely inside U.S. borders. Eight towns border the lake: Alton, Center Harbor, Gilford, Laconia, Meredith, Moultonboro, Tuftonboro and Wolfboro. Over 60 streams run into the Lake, from small hillside brooks to the short Hill River system in the North and the narrow Merrymeeting River of the South. Several dozen small lakes and ponds drain into Winnipesaukee. It may never be known how such a large and wholesome lake can maintain itself from such a confined watershed. Fishing in the "big" Lake is classified as good by many people, and the State Fish and Game and U. S. Government hatcheries keep a watchful eye on it. Salmon, lake trout, bass, and pickerel comprise the principal take, while the feeder brooks are stocked with brook and rainbow trout (and some browns) from the 2.5 million fingerlings hatched each year. Pickerel and perch are popular to the ice fishermen while the winter-paving turns the lake-surface into a playground for fishing, ice-fishing, Skating, and snowmobiling. In 1811 a charter was granted for a canal from Alton Bay to the Sea by way of Merrymeeting, Cocheco, and Piscataqua rivers. Though the Little Pequakit Canal Co. came into being in 1819, no work was done on a proposed project that was intended to eventually extend from the Atlantic Ocean through our Lake, to Squam Lake, and the Connecticut River, and on to Lake Champlain and the St. Lawrence. Formation of Lake Winnipesaukee Surficial and Bedrock Geology studies of New Hampshire indicate that prior to the Ice Age there was no lake here as know it today. The quartz diorite (the primary rock of the Winnipesaukee Basin) was decomposed in place before and during the glacial period, and the power of the ice towards the end of the pleitocene Epoch gouged out the loosened rock leaving hundreds of hills which are our picturesque islands in a hauntingly enticing water world. Geologists point out that the water level of this lake has remained about the same as today. Studies of the hillsides, streams, melt water channels; intervales, and varved deposits prelude the possibility of any glacial dams or deep water such as Lake Hitchcock that once filled the Connecticut River Valley. The conclusion is that the Winnipesaukee River of 1969 is very nearly the same drainage channel that the lake has always had. Boundaries between Belknap and Carroll counties were established in 1841 thus: "Beginning at the easterly termination of the line dividing the towns of Meredith and Moultonboro; thus running easterly to the southerly point of Long Island in WINNIPISSEOGEE LAKE thence easterly to the westerly termination of the line dividing the towns of Wolfeborough and Alton; and all the lands and waters lying northerly of said line and between that and said towns of Moultonborough, Tuftonborough and Wolfeborough shall constitute a part of said County of Carroll." Colonial Governor John Wentworth (History of Wolfeboro published in 1890), says: "In 1770 the Governor's house, though not finished, was taken possession by him and his family, as shown by the following extract from the 'New Hampshire Gazette': 'Last Tuesday His Excellency, our Governor, set out for his country seat on WINNIPISOGEE POND, and wehear his lady sets out next week for the same place to reside during the summer season'. During this and the four succeeding years it is probable that Governor Wentworth and his family spent a large portion of the warm seasons on the Wolfeboro Plantation. The Wentworth Farm was essentially a watering place, probably the first in New Hampshire, perhaps the first in the country. Gilmanton Bounded in March 1731 "The committee appointed the previous year to run the boundary lines, having failed, the appointment, was renewed. July 20, they made their return: 'that they entered upon their duty on 14th of June; beginning at a beach tree standing at the corner of Barnstead, Chichester, and Gilmanton, marked B. C. G; and ran thence 6 miles north east to a white birch. which they marked G; thence northwest to a beach, also marked with the letter G; and thence north to WINIPISOCKET POND, 7 miles, to a hemlock marked with G;" They were absent 12 days. Deed of Masonian Proprietors. Province of N H., June 3" 1752--" to the Proprietors of Gilmantown with the view of granting the same land in year 1727, and the amendment or explanation made in 1729.-- Gilmantown. Only reserving in these presents to the grantors 18 shares, each equal in quantity and quality with the other single shares of the said Proprietors of Gilmantown—between the second division and the north line of said Township from the Pond called WINNIPISIOGEE POND and so running back till the whole quantity aforesaid shall be made up. Gilmantown charter granted the 20th day of May, 1727. John Wentworth, Governor. Granted to 24 persons named Gilman and 153 others. The township then included the present towns of Gilmanton, Belmont, Gilford and all of Laconia and the Weirs on the east coast of the River and Winnipesaukee Lake, on westerly coast. Also in this History of Gilmanton of 1845, is a map of Gilmanton and nearby territory, showing mountains, villages, rivers, roads, ponds and lake etc. The lake given thus: "Part of WINNEPISIGEE LAKE." It appears that Ammi, Ruhamah Cutter and David Sewell have erected a good Saw Mill and Gristmill on a Stream issuing from Smith's Pond into WINNIPISSIOKEE LAKE and upon the Land and Falls in Wolfeboro commonly called the Mill Privilege and have fully complied on their part to the proposed conditions of their having the Land called the Mill Privilege with the Falls stream and appurtenances containing 100 acres together with a certain Island in Smith's Pond called Mill Island supposed to contain 100 Acres. (This Mill Island is what is now called Stamp Act Island). Previous to the settlement of central New Hampshire, the Pemigewasset Indians had a village near the junction of the Winnipesaukee and Pemigewasset Rivers. The site of their village was made into a public park and during that process, hundreds of artifacts were discovered, some of which resemble those used by the so called 'Red Paint People' in Archaic times. The Proctor collection, which contains several hundred specimens from the Franklin-Tilton area, can be seen at the Dartmouth College Museum in Hanover, NH. On the north side of the highway, on Willow Hill in Franklin, there is a glacial boulder with a large bowl-like depression that the Indians used as a mortar in which to pulverize their corn. The first white settlers also used this primitive mill when meal was needed. Pestles of stone or hard wood were used in conjunction with mortars. Heavy pestles were usually suspended from a limp which made the work much easier for the squaws. As their numbers diminished by smallpox, about 1680, they moved up river to the intervales above Plymouth where there had been a village many years ago. They were still known as the Pemigewasset tribe because their headquarters were still on that river. Abbe Maurault in his Histoire des Abenakis calls it the 'Riviere a la Graisse D'Ours.' (The Bear's Grease River). Musgrove's History of Bristol mentions the many artifacts found at Newfound Lake, near Whittemore's point and Fowler's River. The dam at the outlet of the lake raised the water level enough to cover practically all of their lakeside campsites. One of their favorite campsites was at Profile Falls on the Smith River, and another was at the spring near the old highway from Bristol to Hill, NH. The Pemigewasset and Pass-aqua-nik trails joined at Bristol with the Mascoma trail which followed the Smith River in from Danbury and Lebanon, NH. The Kancamagus trail joined the Pemigewasset trail at Woodstock, and the Asquamchumaukee trail joined it at their old village site near the mouth of the Baker River, just above Plymouth, NH. In October 1743, an Indian named Coaus came to a council held in Portsmouth and petitioned His Excellency the Governor to place a truck house or trading post ‘near Pemigewasset where they might have such supplies as was necessary for their furs and that they might not be imposed on as they often were when they came into the lower towns and that they thought it reasonable to have some satisfaction for the lands if the English settled it, they never having had any as set. His Excellency ask him if, for the present, orders should be given to some suitable person at Canterbury to supply them, it would answer their end, to which he answered it would do very well.The Governor asked, "How many Indians are there?" The Indian replied, "There are but three or four that claim the lands at Pemigewasset." His Excellency asked what things would be most suitable. Powder, shot, bullets, flints, knives, blankets, shirts, cloth for stockings, pipes, tobacco and rum, "he replied." On being asked how many would come down, Coaus said there would be fifteen and they would come in the Spring when the snow was gone and if the Governor would send them word at Canterbury, they would give notice to the rest of the Indians and come at His Excellency's Time. The Governor told Coaus that the matter of a truck house would be brought up at the next meeting of the Assembly. On the fertile intervales by Livermore Falls and at the junction of Baker's River and the Pemigewasset, the early settlers found the hills and ridges of old corn fields and the ashes of old campfires with arrowheads, stone mortars, pestles and other implements. Priest Fowle found many traces of the ancient inhabitants on his land bordering Squam Lake. A French sword, a relic of the frontier wars, was dug up in Holderness village many years ago. Black bears have always been numerous in the Pemigewasset Valley. Thomas Locke, an early settler living near Danforth Brook in the town of Bristol from 1777 to 1782, killed sixteen bears on fall on Briar Hill. The prevailing growths of oak and beech trees produced tons of acorns and beechnuts which attracted bears, deer, raccoons and passenger pigeons. Indians from Coos, Ossipee, Penacook, and Winnipesaukee came to hunt with the friendly Pemigewassets who welcomed them with feasting and rollicking by young and old. In 1614, sixty years previous to Gookin's notation, the Winnipesaukee tribe alone consisted of more than four hundred people with villages and campsites at Alton Bay, Melvin Village, Wolfeboro Falls, Moultonboro Neck, Lochmere, Laconia, and the Weirs. There are few, if any, islands in the lake that have not produced considerable evidence of aboriginal occupation. Most of these Indians made their winter headquarters at the Weirs (Aquadoctan) where tons of smoked, dried fish were stored annually for winter consumption and where the hills at their back protected their wigwams from the prevailing northwest winds. Aquadoctan was one of the largest Indian villages in New Hampshire and continued to be a permanent one until the spring of 1696 when the few remaining families, with two young English prisoners, left their homes at Aquadoctan to join the Pequaket tribe on the Saco River near what is now Fryeburg, Maine. The Weirs got its name from the fish traps maintained by the Indians in the wide shallow channel which forms the outlet of the lake. Stones which once held the uprights of the wooden fish-weirs in place showed the first settlers where the original Indian fish-weirs were located, but these stones were used in 1766 to make a wing dam for Ebenezer Smith’s sawmill which had been constructed on the Gilmanton side of the channel the preceding autumn. The Indian village site extended along the north bank flanking the channel for more than a quarter of a mile and along the lake front for a quarter of a mile beyond the railroad station. The total length of the site was more than a half mile, but it wasn't all occupied at one time. The land on the south side of the channel rose abruptly and was too steep for Wigwam sites, but many artifacts have been found on that site above the bridge where the land is flat. Over ten thousand artifacts have been collected from the Weirs area alone, and they may be viewed in collection at Concord, Manchester, Hanover and Laconia, NH, as well as in the Peabody Museums at Salem and Cambridge, Massachusetts. During farming operations on the north side of the channel, large numbers of stone tools were recovered. When the cellar for Moore's hotel was dug about 1890, workmen found forty or fifty gouges, celts, and spearheads. They also found a clay pot containing about three quarts of red ochre. The pot was crudely made without decorative markings and resembled a type known as Early Woodland. When the land for the open air theater at the Weirs was leveled off with a bulldozer, numerous artifacts and several burials were uncovered including two that contained considerable red ochre. The skeletons were little more than white streaks of calcium in the soil. Projectile points with bifurcated bases have been found at the Weirs and Fish Cove. Fluted points will undoubtedly discovered in the Lakes Region as interest in New Hampshire archaeology continues to increase. The pottery in this area is mostly grit tempered and resembles that found in other parts of the state, but not in such large quantities as have been found at Amoskeag Bluff (Smyth Estate) in Manchester, NH. The Weirs was known to the Indians for miles around as a great fishing place and they had several names for it among which were Ahquedaukee, Aquadoctan, and Aquedaukenash which means Weir or Weirs. Jacob Eaton started to build on Hilliard Road, near Pickerel Cove, in 1765. By September 29th, 1766, he had built a house, cleared three acres of land and felled the trees on six additional acres. On the lot where Eaton built were several apple trees that Indians had set out many year before. These so far as known were the only apple trees ever found on Indian lands in New Hampshire. It was here that the first white child of Meredith was born March 11, 1767; the little girl was named Thamor Eaton.